When I first approached Irrfan for Qarib Qarib Singlle, a kind of oddball, quirky romcom, he asked for a synopsis and then sent me a text of three words: “Interesting. Let’s meet”. After this, he took roughly a year to say yes to the role of the funny and cute shaayar, Yogi. He struggled to connect with the character, he said to me, because his own personality was so different from Yogi’s. And then one night, probably at some very late hour, it hit him. He loved Yogi’s unhesitant empathy with working-class people — drivers, cooks, hotel doormen, waiters, street-side vendors. Irrfan identified with this, looked up to it. Here was a protagonist, weird as hell, not at all in keeping with most people’s idea of a romantic hero, but he had a big heart. This abiding and yet unselfconscious affection for all life that crackled and buzzed around him, is what Irrfan would try and bring to his performance. As the co-writer of the script, I felt he had stepped into that secret chamber of the story’s fragile, beating heart, and I knew that my first choice of actor had been the correct one. That Irrfan is an unorthodox male lead is well accepted by now. He doesn’t fall under the label of ‘handsome hero’, and yet scores of women find him hot — this we’ve heard routinely. He isn’t buffed with a chiselled, protein-shake-induced muscularity (we even have a line in the film where his college sweetheart calls him bareek or frail). Very often, he doesn’t ‘deliver’ dialogues; he seems to mumble them instead, bequeathing to them an odd rhythm, a cadence and meter entirely their own. He’ll repeat some words several times for seemingly no reason and at other times, whisper lines making them barely audible. Both seem perfectly legit! There is no rule book here; someone so rightly pointed out to me that he could smile widely in a sad scene and gaze gravely at us in a comic scene, and both wouldn’t seem wrong. So often his face gives away nothing, no emotion or drama and yet, what he wishes to communicate gets conveyed without a shadow of doubt. His acting is almost opaque and yet so crystal clear — it’s a total conundrum! People often critique him for employing a similar tenor in most of his films. He has never drastically changed his basic sur, they say, and yet he varies so much, from film to film. He comes across as nothing but the character. 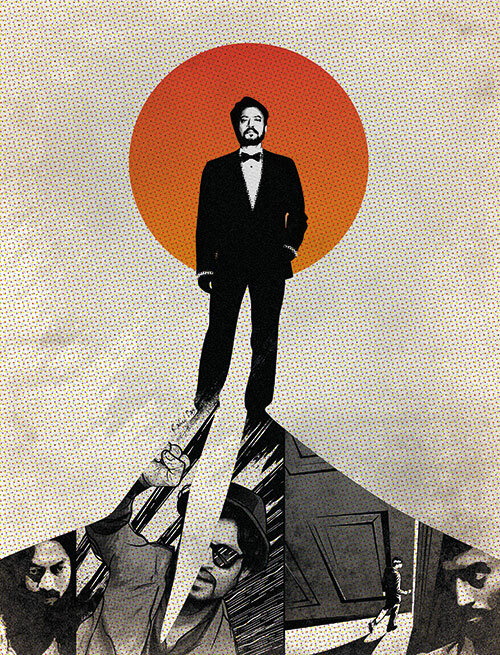 An acting style and a method that’s impossible to pin down — that’s Irrfan for you! Through the fairly long, editing process of our film however, I was able to decode some of the essence of his abundant appeal on screen. I have sat through the film more times than anyone except the editor, and I realised that Irrfan reveals himself in bits. His performance is a dynamic thing. Even when it’s captured in an unalterable way on screen — each frame is frozen, not moving — his character magically grows. And that’s because the minutest, almost imperceptible, seemingly unremarkable calibrations come to your attention, one at a time. And therein lies the secret of this actor’s prowess! His performance is never static. It’s constantly shape-shifting — whether a whiff of happiness sweeping across his eyes in so gentle a manner you would miss it if you looked away, or hurt that echoes in his voice, a voice so muffled, you could barely discern the words in the dialogue, or indeed if it’s the slightest welling up of tears in his big eyes — these are so slight and yet so unmistakably present in his acting, that the viewer is bound to feel he’s sitting right next to the character, soaking in the story. And, yet! Yet, I feel there is so much more he can do. I’m a director that revels in bringing a ton of urgency and truth to a performance through sheer commitment, devotion and surrender to the fictional moment, and I know that Irrfan is capable of monumentally more. Let me be honest — there were several times I was frustrated while directing him, because he can be very stubborn in his insistence of ‘realism’, in his cast-iron idea of it. And I argue — reality is a varying thing, it doesn’t have one colour or one sound, it can just as truthfully be loud as it can be soft. As long as one is feeling the emotion that gushes through the blood in one’s veins, it’s real. That’s it for me; I’ll take no argument there. I agree wholeheartedly with Aristotle who said, “Educating the mind without educating the heart is no education at all”. At times, I could bring Irrfan to my side of the court, and at times, not. Nevertheless, I’m convinced that there is a precipice from the edge of which, if this accomplished actor jumps off into the unknown, he can touch greatness in cinema. The question is: does he believe that?